Polarized light microscopy is often utilized by geologists to study naturally occurring minerals and rocks in thin sections, and by mineralogists and ceramicists for research in industrial environments. A polarizing microscope is also heavily used by scientists who study the various phase transitions and textures exhibited by liquid crystalline compounds, and polymer technologists often make significant use of information provided by the polarized light microscope. Forensic scientists take advantage of polarized techniques in the analysis of fibers, hairs, and other particles that are discovered at crime scenes. The advantages of polarized light have been utilized to explore biological processes. 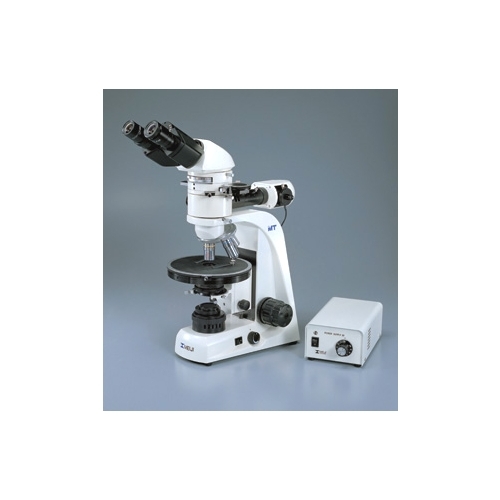 All polarizing microscopes utilize a polarizer and analyzer in conjunction with each other. Polarizing microscopes also include strain-free objective lenses and condenser, a Bertrand lens, a circular graduated stage capable of 360-degree rotation, and an opening in the microscope body or intermediate tube for compensators, such as a full-wave retardation plate, quartz wedge, or quarter-wavelength plate. 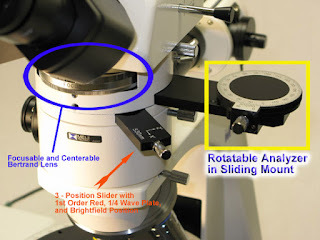 If you were to remove the polarizer and analyzer (while keeping other components in place) from the light path, the instrument becomes equal to a typical brightfield microscope with respect to the optical characteristics. Strain Free Objectives: Stress introduced into the glass of an objective during assembly can produce unwanted optical effects under polarized light, compromising performance. Objectives designed for polarized light observation are distinguished from ordinary objectives with the inscription P, PO, or Pol on the barrel. Polarizing Condenser: The polarizing microscope condenser includes a built-in rotatable polarizer and a strain free optical system, just like the objective lenses. Polarizing Rotating Stage: The 360-degree circular rotating specimen stage facilitates orientation so that the objectives can be centered with the stage and the specimen's center field of view. Most polarized microscope stages will include a vernier scale so rotation angle can be measured to an accuracy of 0.1 degrees. Bertrand Lens: This specialized lens projects an interference pattern formed at the objective rear focal plane into focus at the microscope image plane. The lens is designed to enable easy examination of the objective rear focal plane, to allow accurate adjustment of the illuminating aperture diaphragm and to view interference figures. The bertrand lens is located between the analyzer and eyepiece for easy positioning in and out of the light path. Compensators and Retardation Plates: Many polarized light microscopes contain a slot allowing for the insertion of compensators and/or retardation plates between the cross polarizers, which are used to enhance optical path differences in the specimen. Quartz Wedge: A quartz is used to measure retardation and determining the Z direction. Polarized light microscopy can use both reflected and transmitted light. Reflected light is useful for the study of opaque materials including ceramics, mineral oxides and sulfides, alloys, metals, composites and silicon wafers. Reflected light techniques require a dedicated set of objectives that have not been corrected for viewing through the cover glass. View images captured with a polarizing microscope here.